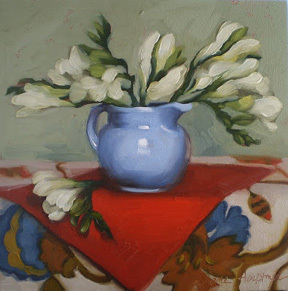 Diane Hoeptner: Win this floral still life painting, April 23rd. Win this floral still life painting, April 23rd. A floral still life will be included in my painting give away that happens April 23rd. You can enter to win it by subscribing to this blog. Three subscribers will be randomly chosen to win a free painting soon, so subscribe today!! All are very beautiful pictures.Thank you so much for share. Love to win this. Can almost smell my favorite flower, freesia. I love it too Diane! It is my favorite floral non-cat painting. If I win, I will give you my address for this beauty!! love this! if you are already subscribed you can win? A beautiful painting and I too would love to win it! I often love your rendering of the vases as much as the flowers! Great! I miss seeing your still life paintings. Lovely and suggestive of my favorite period looks! I would love to hear more about your painting process. Do you cradle your wood panels? Do you like to use birch plywood or masonite? How long, in general, do you sped on a painting? Where do you look for you pattern inspiration? I see your work everyday at Daily Painters and now I will see it in my Inbox too! Thank you for the chance to win your beautiful painting.